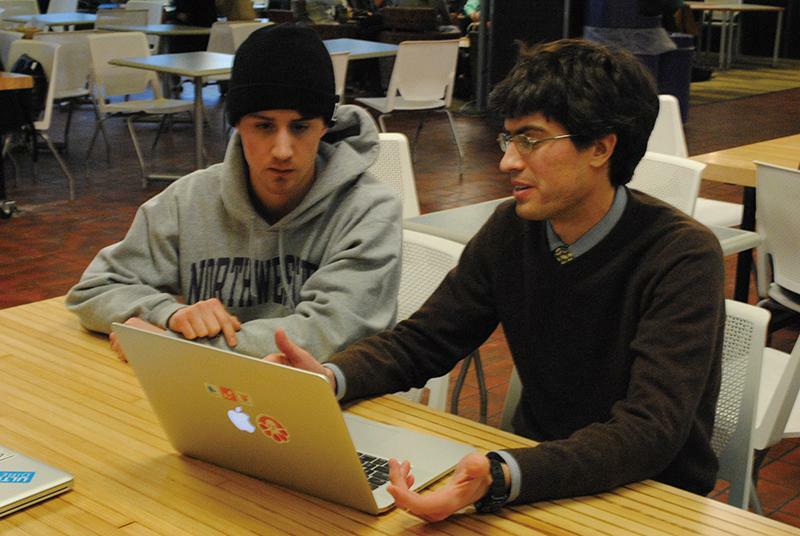 Secret Square developer Stephen Tarzia (right) discusses marketing strategy with the app’s marketing coordinator, Brennan Anderson. The messaging app focused on protecting users’ personal information. A new social media app called Secret Square, released Friday in the Apple App Store, embodies a Northwestern alumnus’ crusade for online privacy. Founded by Steve Tarzia, who received his doctorate from NU in 2011, the Snapchat-like app allows users to send content through the app that will disappear after two minutes. The application encrypts messages to prevent service providers from accessing them. The application revolves around growing public consciousness of the data-mining activities of entities such as the National Security Agency, Tarzia said. “What people like about Secret Square is it lets themselves be … taken out of the spotlight,” he said. Tarzia said his marketing coordinator, Brennan Anderson (Weinberg ’13), set up a booth last week in Norris University Center to gather student feedback on the new app. The very secretiveness that is the hallmark of the application can be a drawback, he acknowledged. People are not as worried about service providers checking data as they are about friends reposting material. Security features on Secret Square only permit users to communicate with others once they have scanned the codes on the application. The code encrypts content but prohibits users from syncing the application to other devices without having to scan codes multiple times. “Some people maybe don’t care about privacy, but for people who do, I don’t think there’s a perfect app,” said Yun Ye, an intern for Secret Square and Communication graduate student. Tarzia began programming the application in November for a company located in downtown Chicago. As the vice president and general manager of consumer products at Vaporstream, Tarzia oversees secure messaging technology marketed to consumers. Anderson and Tarzia said NU students generally regarded the application positively, but some were skeptical about the need to shield content from the public. Others said apps already exist that satisfy their social media privacy needs. Tarzia admitted it is difficult to explain to others the need for privacy from entities that manage the back ends of applications. Feeds on the app do not show the names of the message sender. The anonymity of the application, however, can seem unnecessary among groups of friends, said John Kim, one of four interns publicizing the application. Tarzia said using the technology has opened up his relationship with his wife. Since its launch on iOS devices, 115 people have downloaded the free application. The company is still in its early stages, with Anderson and Tarzia working as full-time employees. Before widening his marketing net, Tarzia said he would like to gather more input from college students. Part of the challenge he faces in getting feedback is attracting groups of people to test out the technology. He is working on a maintenance update for Secret Square that is being processed through Apple. Tarzia said he envisions Secret Square coexisting with social media platforms such as Facebook. Future activities to promote the brand on NU’s campus may include scavenger hunts or speed dating, Anderson said. Correction: An earlier version of this article misstated Steve Tarzia’s role. He oversees secure messaging technology marketed to consumers. The Daily regrets the error.